A wonderful concert of Japanese traditional instruments Shamisen and Shinobue took place on September 22nd at the Army Hall in Skopje. 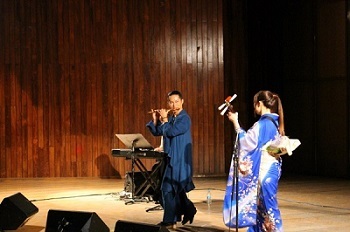 The young and famous musicians Chie HANAWA (Shamisen – Japanese string instrument) and Kazuya SATOH (Shinobue – Japanese traditional flute), both also well known for their appearance on Japanese television, played a fascinating medley of traditional and modern melodies. In the second half of the concert they were accompanied by the talented piano player Tamami HIROTA. 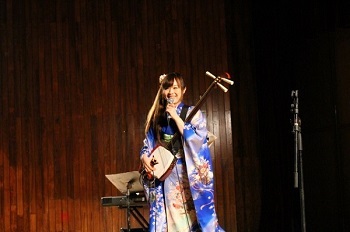 The audience spent an evening enjoying the charm of those traditional Japanese instruments. On occasion of the 20th anniversary of the establishment of diplomatic relations between Japan and Macedonia the Embassy of Japan in cooperation with Teatar Komedija presents the very first performance of classical Japanese Noh theatre in Skopje on September 27, 2014. Noh is a theatrical art form originating in the 14th century. It combines drama, music and dance and has been handed down through generations almost unchanged. In 2001, it has been designated a “Masterpiece of the Oral and Intangible Heritage of Humanity” by the UNESCO. Kyutaro Hashioka, 9th generation Noh actor of Hashioka family, gives insight into Japanese Noh theatre and will perform scenes from the famous Noh plays “Hagoromo” and “Takasago”. For more than 10 years Ms. Hoko Tokoro, a dying and weaving specialist based in Japan, holds annualy Kumihimo and Kusakizome workshops in Skopje in cooperation with the Skopje University, Faculty of Arts. This year the workshops took place on 21 and 22 May at Suli An (Faculty of Fine Arts). Common visitors as well as a school class from Skopje enjoyed the firsthand experience of Japanese traditional craft. Hoko Tokoro introduces the Japanese traditional craft of Kumihimo (silk rope braiding), which has been passed on for 1500 years and Kuzakisome (natural plant dyes), a traditional dyeing technique using natural materials only. In 2014 Japan and Macedonia are celebrating the 20th anniversary of the establishment of diplomatic relations. On this occasion Japanese films under the theme "Secrets of Japanese Technology: Ninja, Transformation and Teamwork" will be screened from March 14 to 20, 2014. The entrance is free, don't miss it! In 2014 Japan and Macedonia celebrate 20 years of diplomatic relations. As the first cultural event this year Prof. Somei Fuhrmann, a teacher of the Omotesenke school of tea practicing in Vienna, will hold a tea ceremony demonstration and a presentation of Japanese confectionary. It will be possible to taste powdered green tea Macha and confectionary. Please feel free to take part in the event. Reservation not necessary! Entrance Free! On June 4 and 5 2013, Hoko Tokoro held Kumihimo and Kusaki-zome workshops. Kumihimo (Braided Cords) is the traditional Japanese craft of braiding cords using braiding stands. The cords are usually made of silk. In former times, clothes were worn loosely and fastened with belts (obi) and braided cords. Later, the cords were used on swords as well as for tea utensils and furniture or household goods. Kusaki-zome (Fabric Dyeing) is a traditional Japanese dyeing technique using natural materials only. The dyeing-colour can be achieved by cooking the "powdered plant" in water, putting a cotton-fabric into the warm water, and then washing out the fabric. Both workshops were held at Suli An, Old Town Skopje (Faculty of Fine Arts).